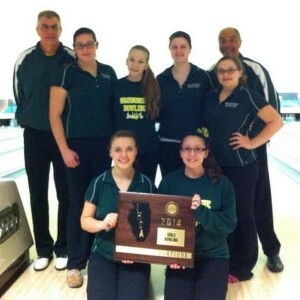 The Waubonsie girls bowling team took one step closer to defending their state title on Saturday, as they swept the field to take the IHSA Sectional championship. The Warriors posted a pin total of 6,394, defeating second-place Minooka by over 350 pins. Oswego (5,937) and Joliet West (5,821) also advanced to the state finals. Senior Julia Bond was the individual champion with a pin total of 1,540. Senior Rachael Felton was second overall with a pin total of 1,316. Seniors Talyssa Melgoza and Sara Barsotti bowled 1,215 and 1,154 respectively.